Mrs. Mary Josephine (Rice) Sears, 73, of Wetumpka, was born August 28, 1943, and passed away on July 22, 2017. She is preceded in death by her mother, Louisa Rice, her father James E. Rice, and her sister Nell Drake. Mrs. Sears is survived by her husband, William A. Sears, Jr., her sons, William A. Sears III and James R. Sears, Sr., and five grandchildren, and one great-grandchild. A memorial service will be held Sunday, July 30, at 3 pm at Memorial Presbyterian Church, 2130 Bell Road, Montgomery, Alabama with Reverend Ben Arellano officiating. Graveside service will follow at 5 pm at Sears Cemetery, Macon County Road 17, Franklin, Alabama. In Memory Notice provided by her son Andy Sears. 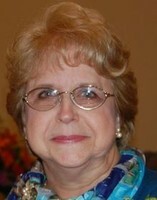 Click here to see Mary Jo's last Profile entry.